Erik Pell, born in 1916 in Nusnäs, registered a handcrafting company in 1947 after having worked together with Lennart and Herman Hållås. After his marriage to Astrid, Erik moved to Färnäs and his wife’s home farm became his warehouse. The production was the usual: horses, roosters and pigs. The sawing and painting were done in Nusnäs. Mehmet Pihiven, born in 1953 on the island of Rhodos in Greece, eventually became Pell Erik’s son-in-law and was brought into the company in the mid-1970’s. Mehmet built a carpentry workshop on the farm and some years later the entire production was moved to Färnäs. Mehmet, whose Turkish father was a furniture builder, took over the firm, including employees and customers, in 1982 after Pell Erik’s retirement. The name was then changed to Färnäs Handcrafts and Carpentry. Locally, Mehmet is known mostly as "The Greek”, in spite of his origin in the Turkish minority on Rhodos. For a southern European the Swedish winter can be both cold and dark. However, after three decades in Sweden, Mehmet feels very much at home, especially with his hunting and fishing friends in Färnäs. To manufacture the Swedish national symbol feels natural for him – and fun! Perhaps it is his Greek ancestry and the stories of the Trojan horse which gave Mehmet the courage to manufacture some of the largest Dala-horses. The largest of them, standing nearly three meters tall and weighing 1.2 tons, is at Dala-wood and Building Materials in Stockholm. 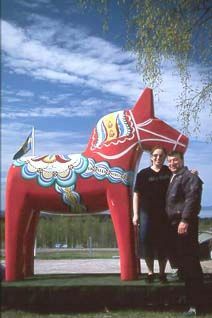 Other large Dala-horses, nearly six feet tall, are at several of the Åhléns Department Stores in Sweden. Åhléns has been one of the firm’s biggest retailers, but products are also delivered to continental Europe and the United States. 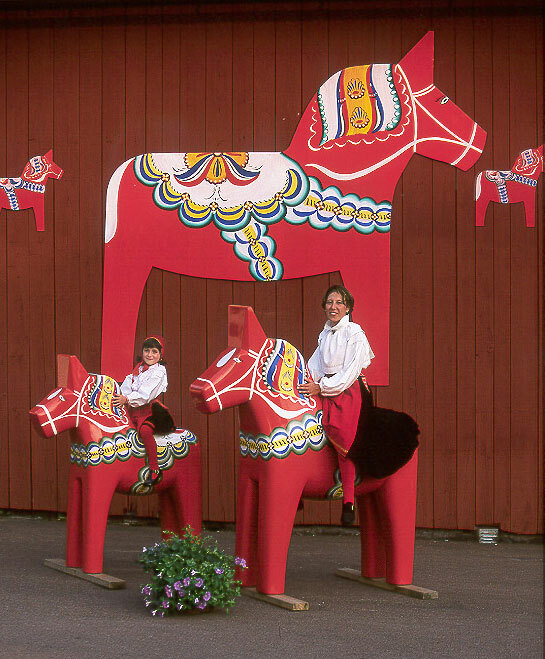 In recent years, the Färnäs horse (created by Pell Erik after a very old original) and the Sälen horse have become popular collector’s items. Outside the Swedish pavilion at the World’s Fair in New York in 1939 there was a three-meter Dala-horse. It represented the Swedish folk art. The leaders of the Swedish delegation were skeptical to the fact that modern Sweden should be represented by a "primitive” handcraft. The colorful Dala-horse received much attention and was much appreciated. The toy horse most often carved by the man of the house for his children became well-known. The horse as a symbol and as a toy is found in many cultures. In that way, the horse differs from other animals – it has a very dear place in the hearts of humans. During the Bronze Age, according to the tales of the Nordic gods, it is the horse that pulls the sun’s carriage over the heavens. A bronze statue of a horse pulling the golden sun on its carriage, found on Själland, Denmark, is one of Scandinavia’s most famous artifacts from the Bronze Age (The Trundholm Carriage). On Greek vases, the sun god, Helios, drives the horse and the hero, Perseus, flies with the winged horse Pegasus to the gods on Mount Olympus. The centaurs, half man and half horse, lure in the mountains of Thessalonia and wait to rob beautiful Greek women. In the Viking’s Asa beliefs we find Oden’s horse, Sleipner, with eight legs and Freja’s Frejfaxe. We find the worship of horses far into the Christian age. The Holy Stefanus became the horse’s saint and traditional Staffan’s songs are numerous throughout Sweden. The horseshoe is hung above our doors in the hopes of bringing good luck. Even in our day, the horse represents qualities that are highly regarded, such as strength, faithfulness, wisdom and dignity. It is not known exactly when the first Dala-horses were carved. The earliest proof to be found is in a sermon by the Västerås bishop, Johannes Rudbeckius in September of 1624. He warns of the "sinful products” on the market, such as cards, dice and wooden horses. Västerås was the church center in Dalarna already at that time. Very early on, the carving of horses in Mora was developed into a marketable handcraft. There is written proof for relatively substantial manufacturing and retail already during the early 1800’s. Specialization was also common; on some farms the horses were carved, on other farms they were painted. On the long journeys to Rumboland in the Stockholm area to find work, a Dala-horse was often given as payment for room and board. The connection to the rustic culture can be seen in the decorative painting on the Dala-horses. The rustic painters from Rättvik inspired the painters in Mora and that is especially prominent in the decorations of the most famous rustic painter from Mora, Stikå Erik Hansson from the village of Risa. Stikå Erik painted horses as well and was probably the one who composed the Mora-horse’s well-known decorative painting, which is still done to this day, with two colors on the brush at the same time. The price for a Mora-horse in the 1880’s was 25 öre. According to the Nordic Museum, the Mora village of Bergkarlås, was the center for the Mora-horse. Later, production was also started in the Mora villages of Vattnäs, Risa, Nusnäs and Färnäs. Poverty was widespread in the rustic culture but if the farm had a horse it was a great help in supporting the family. The horse was the secure, helpful friend in the field, the meadow, the forest, en route to the summer farm, to the mill, the church, the fair, etc.